Tis a wonderment isn't it? Mary Corbet has something far more identifiable on her blog today. She's done another of her Stitch Play series and today it's the cast-on stitch rose. You can see it HERE and find out how she does it. Yep, I'm sadly lacking in the creativity department again today, so will have to rely on others to provide you with entertainment. Firstly, the latest issue of CQMagOnline is up HERE. 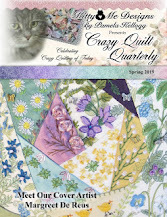 It appears that this might be the next-to-last issue of what has been a fine (and free) online resource for crazy quilters. I, for one, am sad about that. Our thanks to Rissa for handling the reins so capably. Secondly, you might remember me pointing you towards the Heart Strings that Suzy was making. Well, she has finished and it's absolutely stunning. Go have a look HERE! While you're there please take time to do some exploring. You won't regret it. More sights - some questionable, some incredible! Today I finally got back to working in my embroiderer's ledger. Yay! I was beginning to feel extreme withdrawal symptoms. posted by Susan of Plays With Needles. this is what I live with! - There's a free digital magazine you can access HERE from Stampington. Over 200 pages of inspiration! - You all know my fascination with recycling denim and HERE's a great way to make a great storage item for your studio (or maybe even your ORTS!!). - Last, but not least, HERE's another tutorial from Jane using painter's tape in your creations. I'm going to try this one! AND - we had some rain today!! Yesterday we were lucky enough to be able to attend a Blue Jays baseball game - had a great time, but unfortunately our team lost.....boo!! We had excellent seats just above the Blue Jays dugout and a great view of the game. It was fun to see it up close. Yep, it's still hot here. Just a few minutes ago a small thunderstorm rolled through and we got some very much needed rain. It didn't last long enough to do any good though, so we will just have to hope for more. Sorry there are no photos for your viewing pleasure today, but you'll have to just envision two pieces of birthday cake (not that we HAD cake, mind you). Birthdays are rarely a big deal in our lives, but it seems that other people get a kick out of doing our celebrating for us. At least DH and I are fortunate in that his birthday is the 21st and mine is the next day, so we can get it all over with at once! Tomorrow we have tickets to see the Blue Jays (baseball for those of you who don't know) play so I doubt there will be any mumbling from this quarter. 1. If you like knitting, and you like owls, and you like tutorials - go HERE. Such a cute little guy! 2. There's a wonderful 3-D butterfly tutorial HERE, but it's only available until July 31st, so you should check it out soon! While you're there, just look at her blog header - guaranteed to impress. Sorry, no pictures today. It's been (and will continue to be) a busy week. Lots of medical appointments and running around so absolutely nothing fun and creative happening. I guess it's been too hot to be creative anyway, so I shouldn't be upset. Yes, it`s hot cool. Perhaps if I *think* cool it will happen! This is the first stage of a new backsplash and is currently drying for a few days before putting the grout in to finish it off. Jack (DH) and our friend John spent the afternoon in our hot little kitchen doing this. Who knew you could stitch on tissue paper!! Eye candy - by the scores! I've mentioned this before on my blog (and actually took part in it a couple of years ago) and today is launch day, so I'm sending you off to spend time snooping through exploring all sorts of wonderful studios. I guarantee you are in for a great time and will find all sorts of ideas to use in your own studio, however big or small it may be. Karen Valentine is hosting a huge blog party called 'Where Bloggers Create' and if you go to her site HERE and look on the right side under 'Where Bloggers Create 2012' you will find an alphabetical listing of the bloggers who are taking part in the tour. HERE is an example of just one of the wonderful studios you will see on the tour. CreativeCarmelina is a blog I enjoy reading - just to see her eye candy! This falls under the 'who knew' category! Vicki Welsh has posted on her site about the fact that an inch isn't always an inch. I wouldn't have believed it, but because I have faith in Vicki I checked. She's right!! Go HERE to see what I'm mumbling about. $3.99 each - how's that for a bargoon?!! 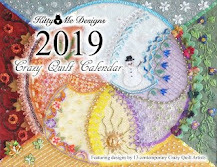 Mary Corbet is one of the most generous souls on the internet and has been busily creating new embroidery stitch videos for us to enjoy and learn from. Looking around her site will lead you to all sorts of valuable information about many forms of embroidery so be prepared to have fun! There are more than 70 stitch videos alone. Go HERE. here's an update on my Embroiderer's Ledger classwork.. Interesting title today, don't you think? and thought I'd share the recipe with you. It comes from Kraft Kitchens. Drain pasta, add to tomato mixture & toss. Now, doesn't this look good? Note: It can be served hot or cold! I stumbled across a couple of really nice tutorials for making insects and thought some of you might be interested. The first one is for a steampunk variation, using polymer clay. Go HERE. The second is for an adorable stitched dragonfly and can be found HERE. This is my completed first page from the Embroidered Ledger class with Karen. I'm actually pretty pleased with it, but I know I have a long way to go! small things and a big party! I'm working, just not in my studio room because it's too hot in here. Stitching in the living room where we have a/c is by far the best place to be. The past few days have been hot but the humidity hasn't been overwhelming. We had rain last night so today the humidity level climbed. with those of us curious to visit. Yep, I'm mumbling again....simply because there hasn't been a darn thing accomplished in my studio for days! Anyhoo... I stumbled across a really sweet free pattern for cute knitted dolls on the Janie H. Knits site and thought you might be interested in seeing it and perhaps creating one (or a few!). It's a great use for scraps. Another great free resource for some great projects (not knitting tho') is from Sue Bleiweiss via her site HERE. Sue has also just had a book published called 'Sketchbook Challenge' and it's definitely on my wish list! Be sure to check out her blog while you're there because she does some pretty cool things.